Softbank, the Japanese multinational conglomerate specialising in telecommunications and the internet, recently announced that its first quarter profits for 2015 had nearly tripled from the year before. It also restated its commitment to turn around the US mobile operator Sprint Corp, which has been struggling lately. Chief Executive and founder Masayoshi Son announced a net profit of $1.71 billion, equivalent to around 214 billion yen. Net profit for the year before was around 78 billion yen. This beat the estimated profit of 135 billion yen. Softbank acquired Sprint Corp in 2013 for $22.2 billion, and the original plan was to merge it with US firm T Mobile. However, the regulator opposed this idea, so instead the company was run as a going concern, but has experienced difficult trading conditions. Mr Son explained that Sprint Corp is slowly but steadily being turned around and that he now has no intention of selling it because he believed that it can become a very good and profitable company. It has experienced an upswing in the number of post-paid customers (those who have a mobile phone contract and who are billed in arrears each month according to their phone usage) as well as lower churn and improved customer quality. He believes that the key to the company’s future is dramatically cutting its operating costs. Mr Son also announced that Softbank would be carrying out a share repurchase as he felt that misconceptions about Sprint Corp had led to Softbank being undervalued. Softbank would repurchase up to 20 million shares at a cost of up to 120 billion yen. As well as wanting to re-energise Sprint Corp, Mr Son is showing increased interest in the internet side of the business. SoftBank President Nikesh Arora stated that the company was committed to seeking out the next generation of entrepreneurs. Bookmark this page to read the next blog post in the series, exploring Softbank’s financial status in more detail. Who Is Using The Cloud? This series’ previous posts have explained how cloud computing works and discussed the various advantages conferred by this technology. The cloud came into existence in the late 1990s, and since then the numbers of businesses adopting it has steadily increased. Board member of Softbank PrinceVille, Mukesh Valabhji, has been watching with great interest just how Softbank used the cloud as an engine for growth. The use of cloud computing is growing all the time and it is estimated that in 2016, the growth will increase to the point that it will form the bulk of new IT spending. It is also thought that by the end of 2017, over half of large organisations will have some sort of hybrid cloud development. A recent survey of IT professionals discovered that there had been an increase of 74% in the use of hybrid cloud technology from the year before. Just over half of respondents said that while the greater part of their application portfolios were not yet in the cloud, they were at least cloud-compatible. 32% run more than a fifth of their applications in the cloud. Cloud adoption is growing, and if companies are not to be left behind, they need to make it a strategic objective rather than a shadow IT project. The previous blog post covered a keynote speech from Mr Miyachi of Softbank Mobile, in which he outlined how technology companies can use the cloud to stay ahead of the competition. This post will expand upon some of the issues and ideas raised by Mr Miyachi – particularly in relation to effectively utilising cloud computing. Cloud computing means storing and accessing data over the internet instead of it being saved on a computer’s hard drive. A cloud app allows users to open a browser, log in and start working – for example, sales people working in the field have access to all client documents, which can be kept up to date in real time so that those back at the office are aware of all developments as they happen. The cloud has caused a step change in the business environment; millions of organisations worldwide depend on the cloud to back up their systems as well as to create and manage documentation and their client relationship management systems. Research has found that companies with over 25,000 employees use an average of 454 cloud based applications. There are many benefits for businesses to obtain through using the cloud. Ordinarily, new applications can take months or even years to implement; the cloud can cut through the traditional complexities, allowing new applications to be accessed instantly and be in full use in a matter of days. There is also no need for an upfront investment in new equipment, software licenses or consultants’ fees; the use of cloud-based software means that these costs can virtually be eliminated. The only cost is usually a monthly subscription. The applications are instantly scalable – the business pays for as few or as many licenses as they need at any one time. Cloud based applications are maintenance-free as well, because the provider of the cloud maintains them invisibly behind the scenes, and they have the advantage of being very secure. A lost laptop is no longer a disaster as no data is actually stored on it. Don’t miss the next blog post on the Mukesh Valabhji blog, which examines the uptake of cloud-based services by businesses worldwide. Softbank is a Japanese multinational conglomerate which operates in a number of industries, specialising in telecommunications and the internet. It is now the 62nd largest company in the world. At a recent keynote speech, Chief Executive Officer and Mobile President Ken Miyauchi gave his thoughts on the challenges faced by companies trying to stay ahead of their competitors, in an industry of ever-increasingly rapid change. Mukesh Valabhji, board member of Softbank PrinceVille Investments, was interested to hear Mr Miyauchi’s plans for Softbank’s progression. Mr Miyauchi explained that as Softbank acquired companies, its customer bases and the corresponding traffic, have increased sharply. The company has enabled this growth and also grown more efficient at data management, largely through its use of virtualisation. Softbank has spent the last 15 years acquiring companies, resulting in an accumulation of 1,200 different systems, but by making use of virtualisation, these have been reduced to a more manageable 360. 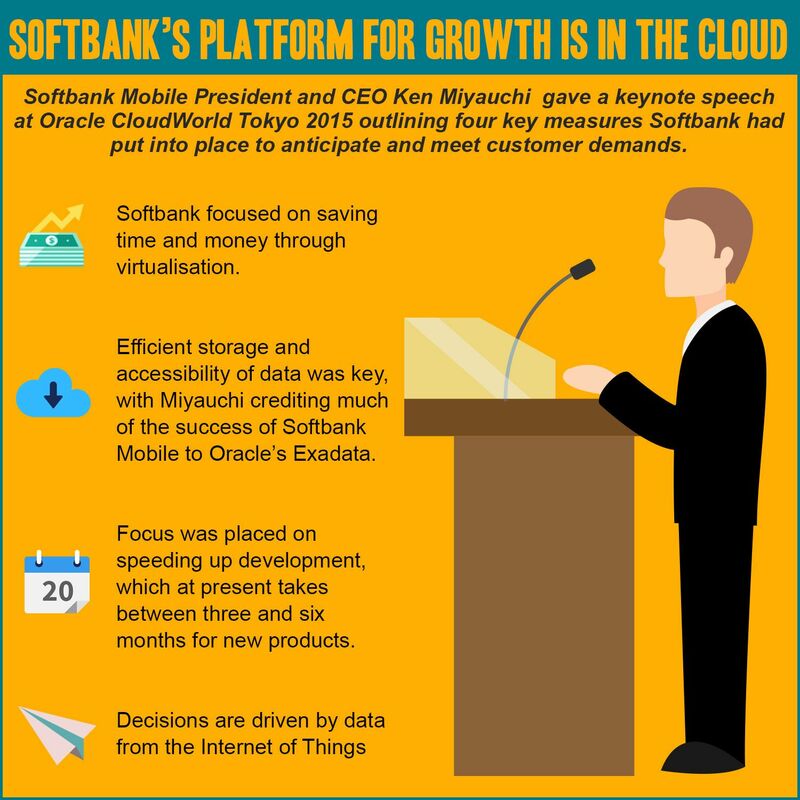 Softbank Mobile also relocated its data onto Oracle’s Exadata data warehouse which allowed it to cope with a tripling of customer numbers (from 15 million to 45 million), as well as being able to manage its customers’ changing needs in real time. A constant challenge for a company such as Softbank Mobile is to respond to development needs in an agile manner. In today’s environment, a lead time of three to six months is simply not fast enough. By using a cloud platform, the company has been able to obtain the resources to stay ahead of the competition by developing new systems very quickly, and it has actually been able to decrease the amount of time it takes to change and refresh their systems. Mr Miyauchi’s final point was that companies need to stay abreast of the Internet of Things, gleaning information from it and being able to interpret it. The Internet of Things is the network of physical objects which contain electronics, sensors, and network connectivity, so that they can collect and exchange data. The next blog on this series will explain how Softbank has been using the cloud as a growth platform. Previous blog posts have discussed how Banjo, a company which collates news from around the world via social media, obtained $100 million of funding from Japanese giant Softbank. Now the latest developments at Banjo are explored in more detail; this video article from entrepreneur and investor Mukesh Valabhji explains what is next for this innovative company. Banjo was originally intended to help people to keep up with their friends’ activities; when its founder Damien Patton realised that there was no room for further growth in this area, he repurposed his company so that it collected and collated information from social media, allowing users of its technology to experience news and live events from around the world in real time. Having secured the investment from Softbank, Banjo announced that it intends to spend the money on hiring more data scientists and also engineers. Its new creation, which has been called ‘crystal ball’, will be a powerful tool for news organisations such as the American NBC and the UK’s BBC. It will be able to alert journalists to breaking news, giving them access to rich content such as eye witness sources. It will also enable journalists to carry out research into ongoing investigations and report on events in real time as they are actually unfolding. Banjo is redeveloping and enhancing its user interface, giving additional functionality. The ‘Banjo Discovery’ application gives journalists the resource of on the ground content, for instantaneous context. In the very time pressurised environment of news reporting, Banjo could give the crucial head start to get on the air ahead of competitors by using its published content. The company has issued a press release stating that access to its crystal ball will be free of charge. Those using it will also have the benefit of its Trending Events dashboard, giving an easy way to stay ahead of the curve. Banjo’s success demonstrates how a company started by one person can become a global commercial success. The previous blog in the series explained how Softbank had invested $100 million in a series C financing round to allow Banjo to expand its offering. Banjo analyses breaking news and events in real time, and is already used by prime news organisations such as NBC, the BBC and Fox to deliver live social content to their television networks. In this article, the investment mechanism will be examined in more detail. Softbank is a Japanese telecommunications and media giant, making the investment in Banjo a good fit with its business model. Previously, Banjo has secured a $5 million series A investment in 2010, followed by a $16 million series B. A series A round is associated with a company’s first attempt at attracting venture capital investment, and the name itself refers to the class of stock which is being offered for sale at this juncture. Series A preferred stock is offered during the seed or early stage round, which is usually carried out during the critical stage in a new company’s funding. Series B is the second round of financing which usually takes place once the company has reached certain landmarks in its development. As the company is more advanced by this stage, the series B investor will pay more than the series A. The series C round occurs when the company is looking to expand further, having already proved its success in the market and being able to demonstrate that it has the potential to reach a larger market. The C and D rounds of financing conclude the early financing cycle, and at this point a venture capitalist may be looking to exit. It is usual for companies to be sold on or made publicly available once the early funding cycle has been completed. The next and final Mukesh Valabhji blog post in this series reveals what the future holds for Banjo now that it has its funding in place. © 2019 Mukesh Valabhji. All rights reserved.